Because Siberian Huskies originated in and were bred for harsh conditions, food was sparse and hard to come by; thus nature provided them with a strong prey drive. As a consequence, Siberians frequently may focus on and instinctively attack many smaller animals such as cats, rodents (including squirrels and rabbits) and birds (even large ones like ducks and geese). 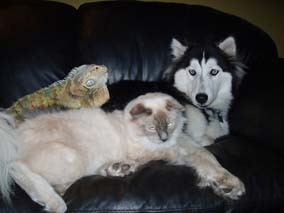 There are anecdotal accounts of Huskies going after deer, sheep and, if they are in a pack, animals as large as horses. However, many Siberians that are raised with cats or other small animals from the time they are puppies live socialized and harmonious lives as part of a blended �pack�. 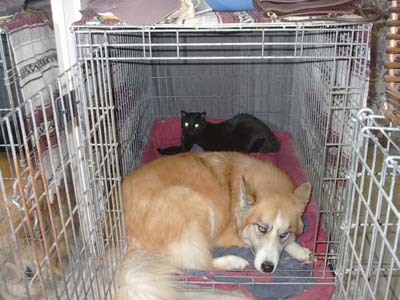 Bear in mind, while they may accept your cat as part of the family, that doesn�t mean the cats - or the chickens, geese, rabbits, or goats down the street are safe if they wander into your Husky's sight. You should take the same care with any breed when it comes to other animals. 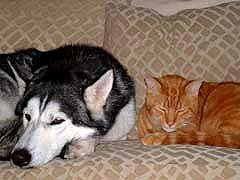 Siberian Huskies are neither the rule nor the exception. 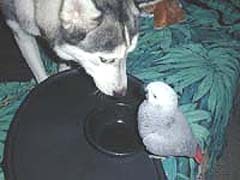 Cherokee shares a drink with her fine feathered friend! Good grief! What will they bring home next? I have to share my den with a CAT! Management will hear about this! !